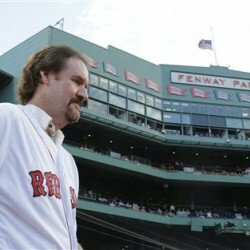 After stirring up some controversy Wednesday night by showing up to the 1986 Red Sox ceremony with his Yankees World Series ring on, Wade Boggs reassured us of his loyalty to Boston during his number retirement ceremony Thursday. When the the names of all the retired numbers were being announced before the unveiling of 26, the camera flashed to Boggs. There was a look of disbelief on his face as he simply muttered “Wow”. Boggs was extremely appreciate in his speech, calling this the greatest day of his life. He also joined Dave O’Brien and Jerry Remy in the booth during the game to do some reminiscing.